These shirts were silkscreened by Amy at Threadbare Screenprinting in west Eugene. She was great to work with and did an excellent job. And she works out of her garage. We like that sort of thing. Unisex version (left) comes in a color called “smoke,” which is what you will do to anyone you encounter climbing Fox Hollow while wearing this shirt. Available in S, M, L and XL. Women’s version (right, with cute short little sleeves!) is a charcoal heather color. Available in S, M and L.
Send me an e-mail (eugenebicyclist@gmail.com) and let me know style, size and whether you want to pay by PayPal (to eugenebicyclist@gmail.com) or in person. Yes, I will try to deliver it to you myself by bike in the central Eugene/UO area. Or we can arrange for a meeting/transaction in the Hult Center parking garage at 9:15 a.m. any weekday. No, on second thought, just suggest a place to meet downtown. I’m a frequenter of coffee shops large and small. I can mail it to you, too, but I’ll have to add $3 for postage. SOLD OUT! 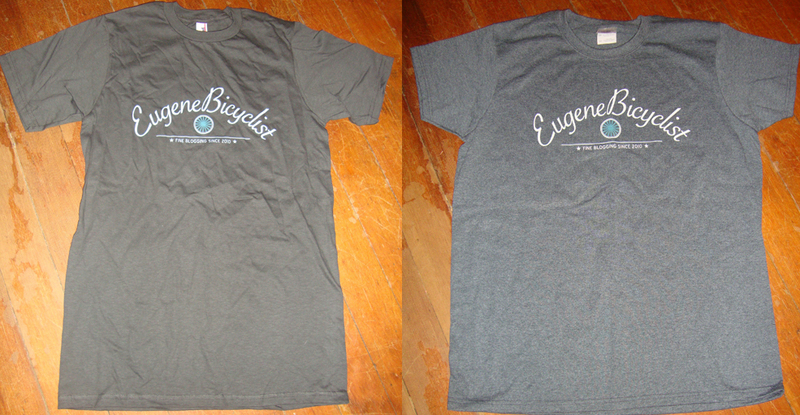 Eugene Bicyclist “Team Crate” T-shirt: $14 $10 close-out! SOLD OUT! We have none remaining of these first shirts we did. If you own one, wear it proudly. There will likely be no more. Cool. I might be in touch. I dig the t-shirt design. Any chance you’ll print more on brown? These were probably a one-time run. New design idea in the works, though, for next summer.